Road trips do not have to be an endless journey of highways. There are many fantastic road trips out there which are beautiful, scenic and truly memorable. 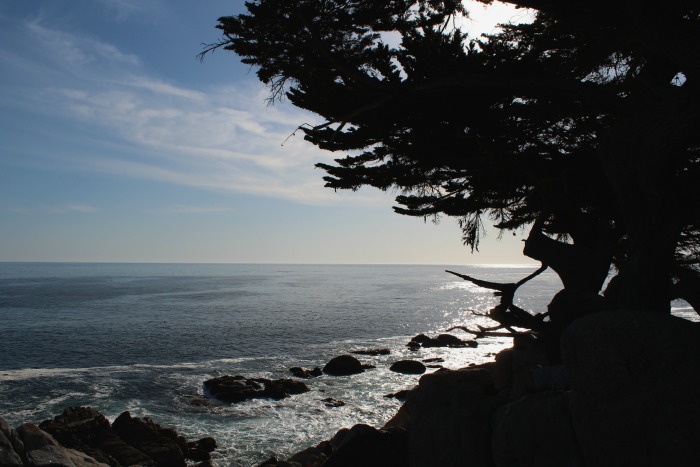 One of the most famous scenic drives one can do is the 17 Mile Drive, just outside the seaside towns of Monterey and Carmel, California. This drive is a little different than most. Firstly, it is in a gated community; secondly, you have to pay $10 to enter (unless you are staying at a hotel inside or know a resident); and thirdly, it may be a short drive of about an hour (going fast-paced); but it is full of important highlights that anyone would enjoy as they cruise along the scenic route on a nice day. This drive is one of the most famous in the world. Established in 1881, it is located within the Pebble Beach community where the famous Pebble Beach golf course and Del Monte Forest are also found. It is a circular route 17 miles long, with 5 entrances that cars can enter upon paying their toll to the guard in the booth. No motorcycles are permitted. Non-residents are given a map to help explain all of the landmarks they will see on their drive. But there are also markers at each ‘highlight’ where you can park, read information and take in the beauty that these stops provide. To ensure you follow the right path, there is a line on the road marking the route of the 17 Mile Drive (though I still managed to get lost once or twice)! You can choose the pace that suits you. You can even stay all day. Once you are inside, it is up to you on what suits you the most and how long you want to spend at each stop. Going fast-paced it will take you about an hour, but a few more if you really take your time. If you stop for lunch or shopping then a half day or longer would be necessary. I went with my mum while we drove along the California Coast, stopping in Monterey for the night before continuing on towards Orange County. It was amazing! 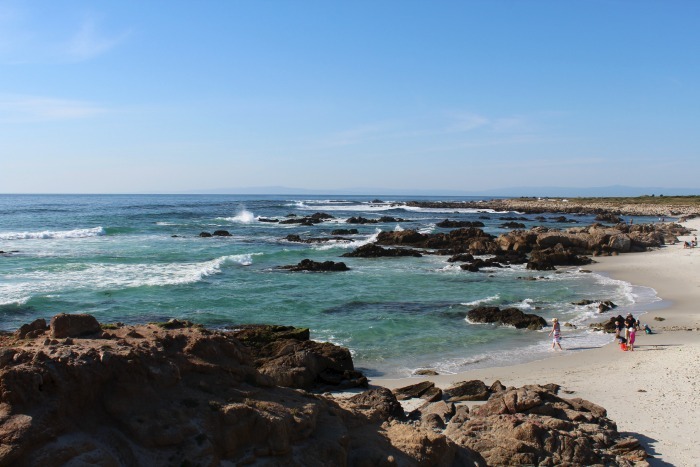 What are the main highlights of the 17 Mile Drive? 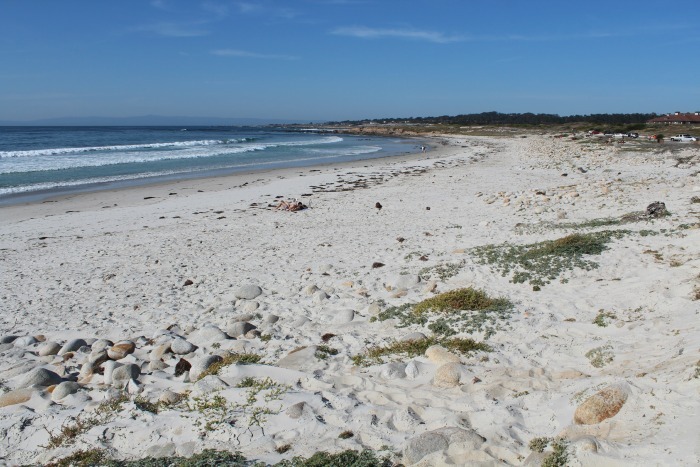 While there are many highlights of the 17 Mile Drive – 21 Markers to be exact; there are some stops which are more exciting than others and definitely should not be missed! The Spanish Bay golf course was built in 1987 by the Pebble Beach Company. It is a Scottish-inspired golf course, with its most notable tradition being the bagpiper that closes the course each evening. Seeing the links from the road is just lovely; and this alone highlights how relaxing this place really is. Just brilliant! With the links on one side and the beautiful beach on the other, this is one scenic stop! 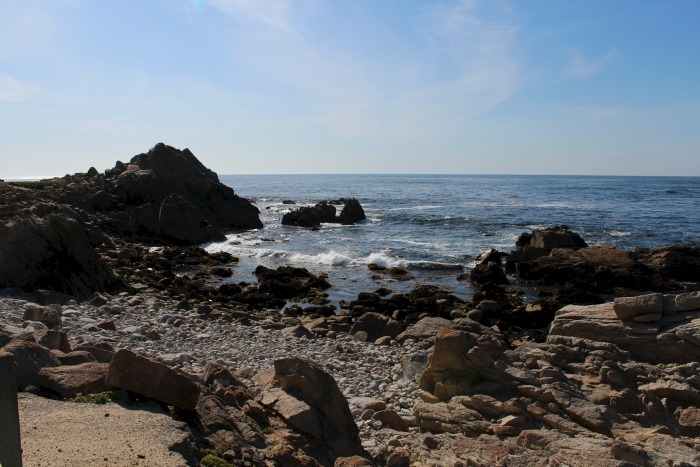 Spanish Bay is known for being the location that Spanish explorer, Don Gaspar de Portola and his crew camped at in 1769 during their expedition to Monterey Bay. This beach is so picturesque and on a sunny day is a beautiful view from the drive. What an amazing place to spend the day if you had the time. This stop offers a different view to Spanish Bay. It is far more rugged, with a mixture of both black and tan coloured rock. The contrast of both against the clear blue sky makes for a really nice sight to see. The Restless Sea was somewhat restless on this particular day, but a relaxing view nonetheless. 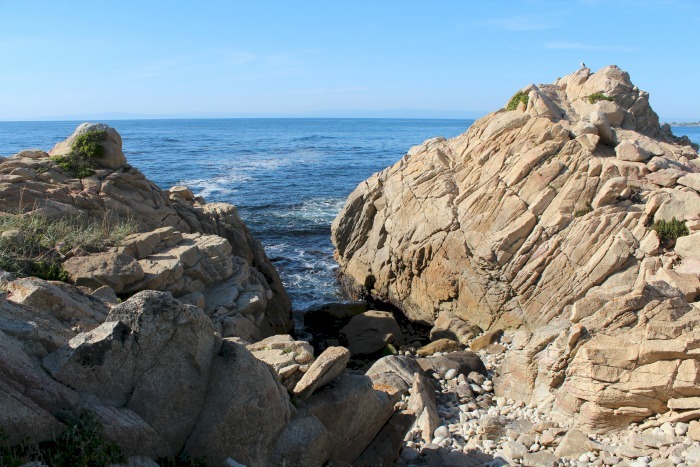 In line with the attributes of The Restless Sea with its rock structure, Point Joe was historically an area which saw boats crash against it after they mistakenly set their course to this point, believing that it was the entrance to Monterey Bay. Point Joe too, offers a very nice view, particularly with its larger rocks looming into the sea. This stop is one of the prettiest, with a white sand beach and rocks which compliment it. This area is usually closed between April and June, as it is where the harbour seals return to bear their young. If it is open when you visit, make sure you stop by for a stroll. It is quite relaxing. The Lone Cypress is the highlight of the 17 Mile Drive. 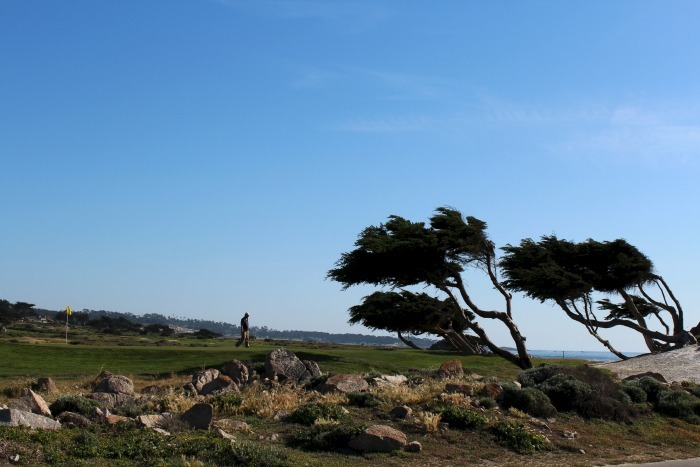 This tree is the symbol of Pebble Beach. It is an icon within the United States and is widely known as the most photographed tree in the country. 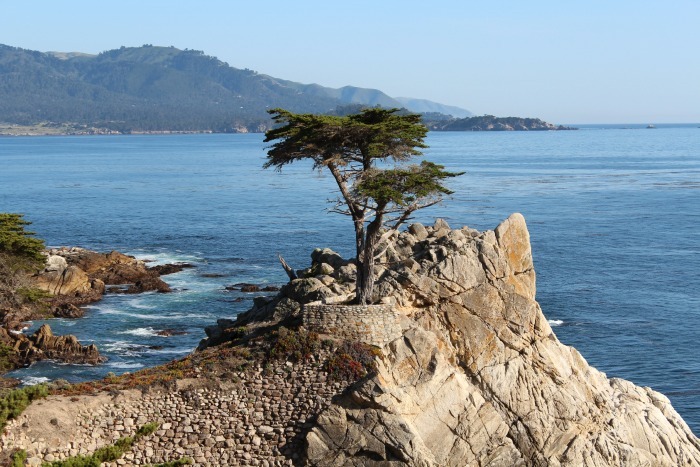 The Lone Cypress has lasted more than 250 years, although it has had some help with hidden steel cables protecting its roots and trunk, to ensure this continues! Standing at the lookout and seeing this Cypress in the distance, on the edge of a cliff with sparkling blue water behind it, is truly something magical that everyone should see for themselves. It is so wonderful to stand there and bask in the beauty of it all. The Ghost Tree is an interesting stop on the 17 Mile Drive. 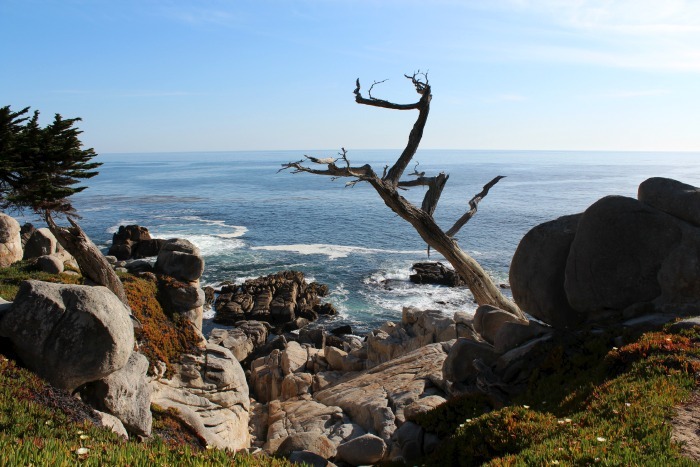 With all of the other stops usually offering pretty views and scenery, the Ghost Tree gives an alternative view to the 17 Mile Drive. It is more of a sinister and spooky stop, but an interesting one, with Cypress trees within this area looking wind-blown and creepy with white and grey trunks and limbs. Pebble Beach Golf Course is worth a stop if you have the time. It is one of the most famous golf courses in the world simply because of how pretty the course is with its breath taking backdrop. We never had time to explore the course and everything within it – restaurants, shopping and so forth. But if you do have the time, it would be worth a wander. The 17 Mile Drive is one of the most picturesque drives in the world. It is the most beautiful drive in America in my view, and worth every dollar it costs to enter. If you plan on driving down the coast from San Francisco (or towards it) on a coastal road trip, do yourself a favour and detour to do this drive – it is stunning! What more could you ask for in a road trip? I am a film and television nut. I travel as much as I can. When I can combine these two things by visiting sets, locations etc I am in heaven. I am an Aussie currently living in London, but looking forward to future long-term adventures in other parts of the world. However, Melbourne will always be home. To read more from me, check out my website!